I was playing around with different techniques last week and I did this background of the bouncing brayer. I thought the stained glass would look good on it and embossed it with Black Detail. For this technique you use a Kalidescope pad, I used my Spectrum pad. Do not push the colors together, but ink up the rubber brayer and starting with the brightest color in the center work the brayer in a circle bouncing it up and down as you go to cover the glossy card stock. I wiped in a circular motion with a paper towel when I was finished to smooth it out. When you emboss on glossy it is important to always remember your x-stactic so you don't get stray ep all over you cardstock. The main image is layered on Rose Romance, then on Basic Black. 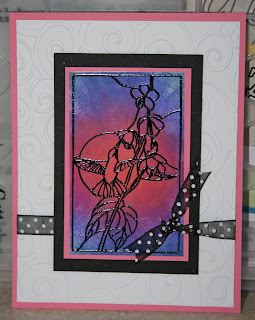 The white has been run through the Swirls Cuttlebug folder, and it is on a Rose Romance card base.